Normally, a changing to a different brush preset will change all brush settings. Locked presets are a way for you to prevent Krita from changing all settings. 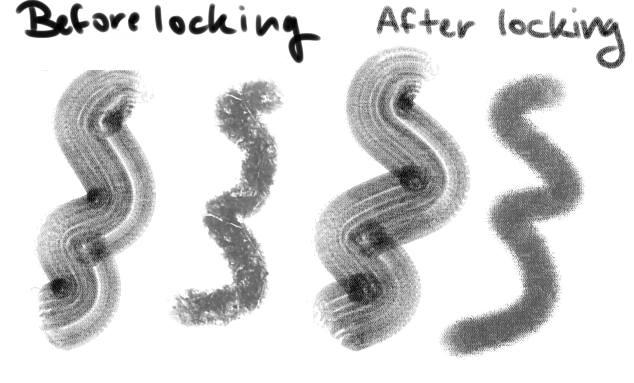 So, if you want to have the texture be that same over all brushes, you lock the texture parameter. That way, all brush-preset you select will now share the same texture! And on the canvas, it will show that the texture-option is locked. To unlock, the icon again. This will get rid of the settings of the locked parameter and take that of the active brush preset. So if your brush had no texture on, using this option will revert it to having no texture. This will keep the settings of the parameter even though it’s unlocked.